Let’s face it, customers care about Total Cost of Ownership (TCO) and Return on Investment (ROI). These figures are a key part of most business cases that are developed to make a purchase. And, the calculations are complex. Actually, that is wrong. The calculations are not complex, but understanding what to include in the calculations is not always obvious. To help with this, many vendors create ROI and TCO calculators. Unfortunately, the vast majority of these are incomplete. And that is why I would like them to go away. Try for yourself, search for ROI or TCO calculator. Find one on a vendor site. Look at the range of inputs. Most of the ROI versions I see only talk about what the potential returns are–they rarely if ever include any details on the investment. And those that do, often only look at the cost of their solution–not the added costs to the business (administration, training, etc.). True, with SaaS, some of these costs (Installation, Configuration, Hardware acquisition) are eliminated or minimized, but only talking returns is not ROI. Similar things happen with most TCO calculators. Ask your customer if they can take forward a business case that does not outline the investment. The answer is pretty obvious. Let’s face it, you could use help building your business case. But when you see a fake calculator, immediately question the company about some of the costs that you know are part of your story. Ask them why they don’t include the ability to add those to the calculation. And highlight for them that delays in your business case delay—potentially forever–decisions. Be more transparent. If you are providing a calculator for potential returns, call it that. Don’t call it ROI. Maybe provide that on your Web site, but offer a more complete ROI modeling tool for sales interactions. Work with existing customers to understand the business cases they developed and then use that to flesh out the range of inputs for your ROI and TCO tools. You might also discover some other areas of differentiation. 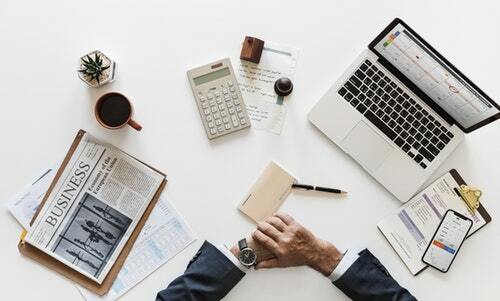 There are cases where ROI is difficult to determine, but there may be other approaches to the business case–take ownership of making business case easier and provide your customer with tools that are complete and not slanted to you. That will build trust and accelerate deals. The 2018 Eastwood Product Marketing Trends Report highlights where technology companies are currently focusing their product marketing resources and going-to-market efforts. Product marketing is a large job with many responsibilities and this report will help you understand where technology companies are focusing their product marketing resources. Establish and maintain a clear purpose. People meet for a variety of reasons – to disseminate key information, make decisions, assign resources, solve problems, mitigate risks, brainstorm possibilities, etc. Whatever the reason is for your PMO meeting, we strongly recommend you remind people every single time you meet. That’s right. Every time. This practice prevents newcomers from hijacking or disrupting your meeting, and sets the boundaries for the topics under discussion. Establish roles and minimal attendees. Most meetings have too many players. We recommend the “RACI” model with “Responsible” player being the one who owns a function or key initiative being covered. “Approver” is usually a director, VP or C-level executive who approves what the Responsible player recommends. The “Contributor” offers necessary input into any action or decision to be made. And “Informed” are the ones who just need to be told the final outcome. We recommend at the most 7-8 players in a meeting. Move deeper discussion offline: you’ve all experienced meetings where someone brings up a topic that becomes a “rat hole” in which the team attempts to solve a problem as a group. It might be a very valid topic worthy of deliberation but certainly not by the broader PMO team. The better approach is to interrupt after about 3 minutes (use a 3-minute “hour glass” like timer) and clearly articulate the problem statement or item needing deeper discussion. Call it a “parking lot” item for now. Use RACI to clarify who must participate in that topic, assign a deadline, and have the Responsible person report back no later than the next PMO meeting. Surface risks to mitigate them: the practices above may feel like a “checkbox” approach to project/program management meeting which may inadvertently discourage quality discussion. Moving discussions offline must not come across as squelching the team’s valid concerns. We recommend the leader go around the table asking each person to speak up on a risk they see that requires a mitigation plan. Ask for their recommendation too. Use a consistent reporting format: a project/program management type meeting is specifically meant to detect and manage risks so that the team can achieve the committed goals on time, on budget. We recommend a dashboard with red, yellow, or green status indicators for each key tactic. Have measurable criteria to determine these conditions. Items that are yellow or red should require the Responsible person to explain why the item is this color, what the plan is to get the item to green, and what help they are requesting of the team. The best PMO leaders will work ahead of the meeting to find out which item is turning yellow/red and coach that responsible owner to work diligently to manage the risk. Be a strong, disciplined facilitator: first off, have a leader for the meeting! Ever been in a meeting where there’s an awkward silence as everyone is trying to figure out who is running the meeting? An effective meeting requires both team cooperation and a strong leader. It’s helpful upfront to tell the team you might have to cut discussions short, note the item for “parking lot”, and setup an offline meeting, if needed. The team also needs to support the leader by staying on topic, and being clear on when an item needs discussion offline. Use a good web-based tool like Wrike or Jira: the PMO meeting is just part of a broader process such as product development, product launch, marketing campaigns, strategic planning, etc. Tools like Wrike and Jira offer powerful yet easy to use ways of tracking action items, owners, due dates, and dependencies. They also facilitate team collaboration in between meetings with threaded discussions. We have many more tips to offer you but these are the top seven tips. What practices have you found that are particularly useful? Most organizations love the idea of a win/loss program. They imagine a process by which they can better understand their buyers’ evaluation and decision-making approaches, track the effectiveness of their sales and marketing efforts, and uncover useful insights about the competition. As advertised, leading win/loss programs provide all of that and more. However, their effectiveness and impact vary by organization. A number of variables determine program success. Executive-level ownership and participation, sales leadership endorsement and sales team accountability, and a strong and influential internal program manager make a world of difference. Which of these actions is aligned with our corporate goals and objectives? Which of these actions will make the greatest short- and long-term impact? Which of these actions will help to address an issue that has the potential to knock us off course and negatively impact our business? What metric can we use to measure the impact of the action we are about to take? Using that metric, where are we today? Who is going to own this action? How will this person report on the progress associated with the action? By what date will this action need to take place? On what date and in what forum will the owner report on the completed action? When is the right time to measure again? How does our metric compare today to when we first took action? Besides the action taken, were there other factors that impacted the metric? This simple approach to taking action and measuring results is the biggest difference between good programs and great programs. Who should own pricing? When I ask students this question, it almost always evokes emotion. Some people respond confidently, while others are more sheepish. And a lot of people think their companies are doing it wrong. Before we answer this question, it’s important to define just what it means, because there are so many pieces to the pricing puzzle. For example, someone must decide which pricing model to use. SaaS or perpetual license software? Do we price by the seat, the gigabyte, the transaction or something else? Usually, executives decide this, or at least participate in the decision. Another aspect of pricing is to negotiate discounts. In most companies the sales team does (and should) own this part of pricing. Using this definition, the answer is obvious: It must be someone from the product team. These are the people in the company whose job it is to know how much value the product delivers to buyers. And the person setting the price must know value to put in place value-based pricing (VBP). VBP is the basis for all profit-maximizing pricing strategies. It means we charge based on what buyers are willing to pay, which is a function of the value buyers receive. The product team is uniquely positioned to know that value and determine how much markets are willing to pay. How do customers decide their willingness to pay? They make their decision using one or both of the following methods: value in use or value in choice. Value in use is when customers estimate the inherent value they get from buying a product. They will pay some percentage of that value to buy the product. For example, how much would you pay for gas if you’re in the middle of the desert, your gas gauge is on empty and you see a sign that says: “Last gas for 75 miles”? Probably a lot. That is value in use. Value in choice is when buyers compare your product with an alternative. If they decide they get more value from your product, they will buy it. Imagine a busy intersection with a gas station on each corner, and your gas tank is empty. How much would you pay to buy gas at the most convenient station if all the other stations are charging $2.25? Probably much less than what you would pay in the desert. That is value in choice. To use VBP, a person must understand the value that the markets and market segments receive from using your products. They must be able to put a dollar value on it. Even more challenging, they must understand value in choice. This means knowing competitors, their prices, how they are different (better and worse) and how much buyers value those differences. Who inside your company understands this value? The product team. They know the competitive landscape and understand how your buyers make decisions. And because they must understand all these things, they should be responsible for setting prices. Your finance team should not own pricing. Finance has the desire—but not the knowledge—to set prices based on value. Although they care about margins and understand costs, finance people don’t know the value their products deliver and they don’t know their competitors’ products. If finance sets prices, the only method they can use is cost-plus pricing. You might argue that sales could set price. After all, great salespeople are value-focused; they try to understand value from each buyer, which aligns with VBP. However, they have two strikes against them. First, salespeople have the incentive to close deals quickly, which often means dropping the price. Second, they don’t see the entire market, only their specific customers. Someone needs to aggregate this information to provide companywide guidance. An additional reason the product team should set prices: They determine what the next product will look like and which features have highest priority. Whoever makes that decision is who I want to own setting prices. Why? Because companies should strive to make products that buyers value more. To do that, they must choose the best new features, ones that add more value to their product in the minds of their buyers. If product management owns setting prices, they are in that exact mindset. They get to decide which new capabilities might give them the ability to charge more. What is different if finance sets prices? Again, the only way finance has to set prices is cost-plus. They take the cost and add a margin. When deciding whether to add a new feature, product management then would only need to determine if buyers are willing to pay more than the cost plus the margin. If the answer is yes, then put the feature in. If the answer is no, omit it. This would be especially onerous for software companies. The marginal cost of manufacturing any new feature is near zero. This would allow product management to say yes to virtually anything and still meet that rule. The product manager has no incentive to find new high-value features. The company won’t charge for them. Hence, the company ends up with only slightly better products. If sales sets pricing, product management doesn’t need to understand the value of their product. When deciding which features get priority, they would just rely on sales. In fact, when sales sets pricing, they become the de facto product team. To make it worse, each new capability sales asks for will be based on direct customer requests. It’s a surefire way to ensure that the company only builds incremental innovations. The right answer is to let product management set the price. Their goal should be to choose the price and product features that maximize the profitability of the product. They can trade off the importance of customer requests against the value of brand-new capabilities. They have control of both important levers, price and product. If you want to maximize profits, the product team is the only section of your company with the knowledge and incentives to effectively implement VBP. More important, if you want to create more valuable new products, the people who define the next product should also be in charge of setting its price. One of the tools we use to answer those questions is “Job Stories.” Job Stories focuses on capturing situations, motivations, and outcomes. The result typically looks something like this: When [situation]happens, customers want to do [job or motivation] to accomplish [outcome]. A majority of SaaS companies that I have built products for have brought their products to market with a sales led G2M motion. The sales reps would source new customers through outbound efforts and engaging their professional network. This method was great when we were trying to find product-market fit as the sales reps were close to the customer and we had easy access to interview the customers we engaged with. However, as our business grew we ran into challenges efficiently scaling our G2M efforts. We did all the right things. We invested more into marketing and reduced the size of the sales team and as a result gained some customer acquisition cost (CAC) efficiencies. Marketings goals were to get more customers speaking with sales reps. Once the deal was done, the customer then got access to our product. We thought we had it all figured out, but a new problem emerged. There was a growing gap between what customers thought our product could do for them and what it actually did. As a result we now struggled with keeping our top-line ARR as our customer churn rates were too high. We were stuck in the SaaS grind of acquiring customers knowing that we couldn’t serve them well. We beefed up our customer success organization, trying to patch the revenue leak and ended up increasing our operational costs to deliver our product. Many SaaS companies find themselves in this same situation and I want to share there is hope. To get out of the SaaS grind, you must address the customer expectation gap by getting customers into your product earlier in the buying cycle. This is achieved by offering either a free trial version of your product, or providing access to your product during a POC period. 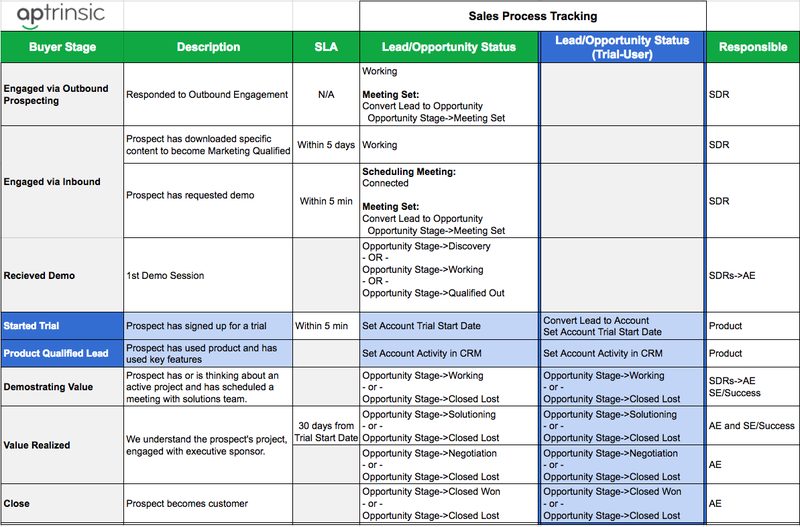 With your current process, you track a lead’s lifecycle in your marketing automation and CRM systems. Using this setup, you set the following lead statuses along the way; Lead, MQL, SQL, Opportunity, Customer. You now need to incorporate a new state; where the lead is in a trial state within your product, either having started a free trial, or have been provided access to a POC. The first step is to decide collectively between your marketing, product and sales team how to categorize a user who has signed up for a trial. Should they be considered a lead? When should sales engage? When do they qualify as an opportunity? Given you are aligning the activities across multiple departments, it’s recommended you start by documenting your buyers journey and how it aligns with your sales process. For each stage in the process, who is responsible for what activities. With this shared understanding you can now paint the process together on how to incorporate trial users into this process. Find below a simplified example where each stage in the buyer journey is mapped and how the trial users can be incorporated. The goal is to align your teams and provide visibility into conversion rates at each stage to know where to optimize the process. Not all trial user are ideal candidates to become customers and as a result you don’t want your sales teams to engage deeply with every user who signs up for a trial account. Just as you had implemented the concept of Marketing Qualified Leads based on the person’s demographics, firmographics and marketing content consumption, you now can create the equivalent based on the features they use in your product. Your product’s role just got much more important to the sales process. You now want to define the set of features your customers can use to realize value, also known as the “first mile of product”. When your trial user adopts specific features, you can then categorize them as a Product Qualified Lead™. When trial user reaches the defined threshold of product feature activity, you can then notify your sales team to engage. This step is where your planning meets your execution. Now that your teams are aligned on the process and you’re able to use your product to identify qualified leads, you need to make it easy for your sales teams to know when a trial user is ready to buy. In your CRM, you need to have the information you sales teams need to properly engage with the lead. In addition to the demographic and firmographic information on the trial users, you will want to provide your sales team with what features they used in your product. Triggered alerts can be sent to lead owners when trial users become product qualified and specific views can be created to help prioritize their engagements. Armed with this information, your sales team now have a more complete picture of what challenges the prospect is looking to address with your product and can offer the best package to fit their needs. You have also allowed your customer to realize the value of your product first-hand and set value expectations to make them a happy life-long customer. In this article, we cover the marketing and sales operations changes to incorporate a free-trial or POC within your enterprise sales process. For a complete guide to using your product to accelerate growth, download a free copy of our book Mastering Product Experience.